There can be a number of reasons when an iPhone user needs to transfer videos to his/her own PC. In case of video sharing, video editing and uploading, backup, clearing storage etc., it is inevitable that users go for the transferring option. As a PC or a Mac gives the opportunity to do all these things without any issues! So, before you ask how to transfer videos from iPhone to PC, we are here with detailed methods that can help you send videos to your PC easily and effectively. Go through the article and follow the steps carefully. Our first choice in this article is Tenorshare iCareFone. This tops our list as it is simply the best option to go for if you want to know how to transfer photos and videos from iPhone to PC. It supports all versions of Windows namely, Windows 10/8/7/XP etc. and even Mac. With the help of this software, you can opt for managing files and can easily select one or multiple videos at the same time for transfer. There is also an option for bulk transfer as well. Another great advantage of using this software is that there is no iCloud storage limitation associated with it, and it can also transfer videos from any app such as WhatsApp, Kik, Snapchat, iMessage etc. You can preview videos before transferring as well. No other methods offer these advantages. 2. Install the software with the help of the wizard. 3. Use a USB cable to connect your iPhone to Windows PC. 4. Find and hit "File Manager" from the main interface and simply tap on "Videos" from the options present. 5. You will see all your videos now in front of your computer screen completely sorted. Preview your iPhone videos now. 6. Choose the videos you need after previewing and simply click on the "Export" button. Voila! You are done! Now, the software will do the job for you. It will transfer all the selected videos to your PC anytime now! And this is also the only way to transfer videos from iPhone to PC without itunes. The main struggle Apple users face with Windows OS is that there is no app or software to support the transfer process. There is iCloud for Windows to sync your iPhone and computer, but that would require Wi-Fi, iCloud account, storage limitations and what not! If you don't want to use Cloud services, don't worry, with the newer versions of Windows like Windows 10 or 8 you are fully covered. As Windows 10 comes with an in-built Photos App which is similar to the Mac Photos App and it helps to transfer your photos and videos. But, keep in mind, you need to install iTunes for Windows on your PC; otherwise, it is impossible for Windows to recognize your iPhone. 1. Get a USB cable and use it to connect both of your devices. 2. 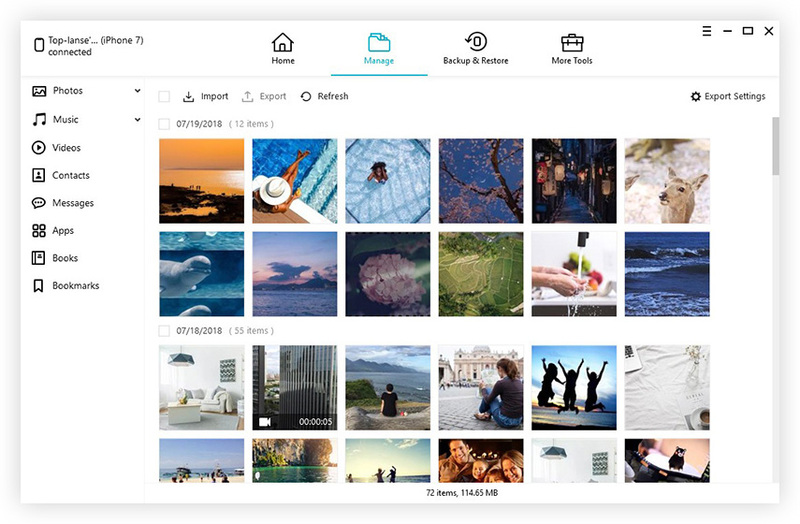 After the connection is established, the Photos App will be launched automatically. 3. Click on the Photos App and a new window will be opened, showing all of your pictures and videos stored on iPhone. 4. Now you have to click on the Import button to start selecting the videos you want to transfer. 5. After selecting, click on the Continue button below. All of your videos will be imported to your Computer. So, this is how to transfer videos from iPhone to PC Windows 10. The addition of Photo App on Windows 10 has made it very easy for any iPhone user to share photos and videos with their home computer, otherwise, you had to install several apps and go through several typical processes. 1. Get a USB cable and connect iPhone X/8/7/7Plus/6/6S/5/5S/SE with your PC. 2. Give it a few moments and then unlock your iPhone. 3. A pop-up will appear asking your permission to Trust the computer. You need to tap it. 4. 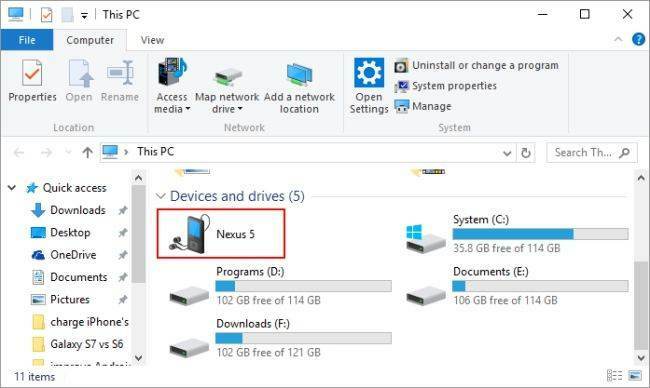 Now, open the Windows File Explorer on your PC by pressing "Windows" and "E" on your keyboard. 5. Visit "This PC", the iPhone will be indicated as a portable device now. 6. Click and go to the "Internal storage" and look for "DCIM". 7. Inside "DCIM" you will find all the videos and data. Select the videos you need and transfer them. The File Explorer is a good option to transfer data, and you can easily use it. But if you want to go another way then you can also use the Photos App. It also has a built-in option but only available on modern versions of Windows. 1. You have to install iTunes for Windows on your PC. 2. Then get a USB cable and connect the two devices. 3. After your PC recognizes the iPhone, the AutoPlay dialog box will be launched. 4. The AutoPlay panel will show a few options, click on "Import Pictures and Videos". 5. Now, a new window will be opened and it will let you set a destination to transfer videos. 6. Now, you just need to select the pictures and click OK to import the videos. Everything is done! You can unplug the cable now. So, here are the most effective methods listed with step by step details of all the things you need to transfer videos from iPhone to PC. So, if you using a standalone Windows PC, this all-in-one guide can do the job! All of these methods are effective and can transfer videos easily but if you want our opinion, go for the best, Tenorshare iCareFone. It won't need the support of iTunes and it will work on its own giving you faster transfer speeds and a lot of other useful features! If you like this article, don't forget to comment and share!